Except it isnt Petter Solberg in the driver's seat. We think world-class safety on South African roads is essential, not an optional extra. That's why we've been crash-testing our cars since 1965, long before it was a legislated requirement. We’ve spent over 20 years developing safety technologies like EyeSight, the world’s first driver assist technology that uses only cameras to identify cars, cyclists, pedestrians and other hazards to warn you about them – so you can avoid potential dangers. No other car drives like a Subaru since no other car is built like a Subaru. We are the first and only car company to deliver the drive distribution to all four wheels, all the time across all our models through our Symmetrical All-Wheel Drive (SAWD) System. 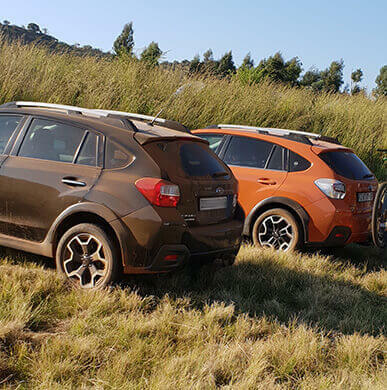 From the symmetry of our SAWD system to the layout of the Subaru Boxer engine, every Subaru vehicle is designed from the ground up to deliver the best driving experience possible. This means better control, better safety, and ultimately, better pleasure when you drive. We do more than just build great cars. We engineer our products to help South Africans get more out of life, giving them the safety and confidence to do it. Just one drive and you will see how our Japanese-inspired, forward-thinking imagination brings you peace of mind while you drive. Our smart, intuitive innovations allow you to focus on the drive, with peripheral functionality taken care of. What if you could see it coming? Subaru EyeSight is our award-winning driver assist technology. It monitors the road, recognises potential danger and assists the driver to reduce the occurrence of forward collisions, or completely avoid them. An extra set of eyes, and an extra foot on the brake if required. Those who dare, win. It's a history written in tarmac, carved in gravel and burnished with glory. Since its debut in the Subaru World Rally Championship, the WRX STI has taken on the most gruelling challenges in motorsport and thrown down some of the most extreme acts of performance. Each test adds to its quickness, its toughness and its legend.